C =(1 - f )Ci where V is the volume of the water body (m3), C is the concentration of the element in the water body, Ci is the concentration of the element in the incoming water (inlet + wet and dry precipitation), and C0 is the initial concentration of the element, all in gm~3, fi is the fraction of incoming element deposited in the sediment, Q is the inflow (inlet + wet deposition) in m yr~ , and t is the time in years. The model suggests that the net deposition is a fixed proportion of the incoming mass of the element. The phenomenology behind this concept is that an element enters the water body in particulate form and sinks to the bottom of the water body, where it stays permanently. The concept may be valid for true conservative elements as many minerals, but most elements - especially the dissolved parts - are subjects to physical, chemical, and biological transformations in the water. where R is the proportion of the loading being deposited as the net. where P is the lake phosphorus concentration (gm-! ), Pi is the incoming phosphorus concentration (gm-3), and RP is the phosphorus retention coefficient (=1 — (P/Pi)) (see Empirical Models). All of the models based on multilake data show an inverse relation between phosphorus retention and flushing rate and a retention increasing with increased inflow concentrations, but the behavior of individual lakes may vary considerably. 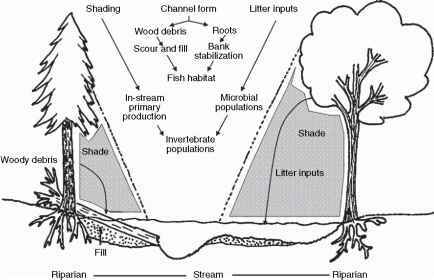 The empirically derived one-box models are highly aggregated and consider the whole water body - including the sediment - as a black box, where net sedimentation is a one-directional flux like inflows and outflows. However, very little information on the behavior of aquatic ecosystems is gained from these types of models and the relations between constants are often speculative and the only reality left is, that particles may sink. But for water management on a regional scale and a timescale of years, they certainly can have a predictive power. If more information on ecosystem behavior has to be achieved and predictions have to be made of short-term behavior of individual lakes, theoretical models have to be used. Such models are less aggregated in time and space and include several processes and most often use a time-scale of 1 day.